Murdock Farm in central Massachusetts was almost 200 years old when the herd was sold and dairy operations ceased in 2001. Seven years later, the three senior Girouard brothers were ready to sell. The brothers shared a commitment to keeping the operation going. They began work with Mount Grace Land Trust, the Massachusetts Department of Agricultural Resources (MDAR) and the Town of Winchendon to restrict future uses to agriculture. To begin the process, Land For Good conducted a two-hour interview with seven family members from three generations. Next, LFG prepared site maps to help family members sort the options for how small portions of the property might be divided among family members while keeping the farm as a whole intact. We generated scenarios for which parcels to protect, which to transfer to family members, and which to retain for sale as a farm to a non-family member. 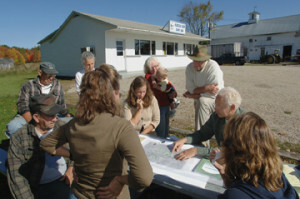 The resulting plan suited both their vision and aspirations for the future of their land while meeting the guidelines of the MDAR. An assessment report and planning maps aided their attorney in revising their wills and drafting other documents reflecting their decisions and the APR award. A few years down the road, the plan will help the family recruit and select the next appropriate farm operator. The Girouard family is relieved and satisfied that their goals for their beloved farm will be achieved, and Murdock Farm will remain in active use for future generations.